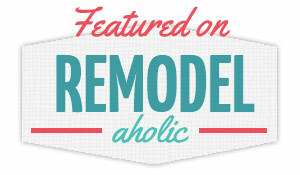 The Happy Homebodies: Kitchen Upgrades: Yes Please! When we bought the house, it had a galley kitchen with two-tone cabinets and beige laminate countertops. The appliances were mismatching and outdated. The microwave just sat on top of the counter and took up valuable space. We have now replaced every appliance except for the dishwasher (which works so well that I have no desire to replace it). We got a bargain on every single one because we pretty much refuse to buy anything unless it is on sale. Fridge: The previous owner took her fridge and we replaced it with a beautiful Samsung side-by-side with fancy schmancy blue digital letters on the ice dispenser. Like any boy, Scott was drawn to the shiny buttons and sleek appearance of the ice dispenser, and I thought it was pretty cool myself. The door hinge was a little off so they had it on the discount aisle at Lowe's. This was our first encounter with our local Lowe's, and now we know the manager by name. He probably dreads our appearance because we always ask for discounts, but hey, we get some good discounts when we ask! He gave us this beauty for half off the original price and ended up paying $650. I was quite proud of the hubby because he is usually reluctant to ask for discounts and he negotiated that deal all by himself. 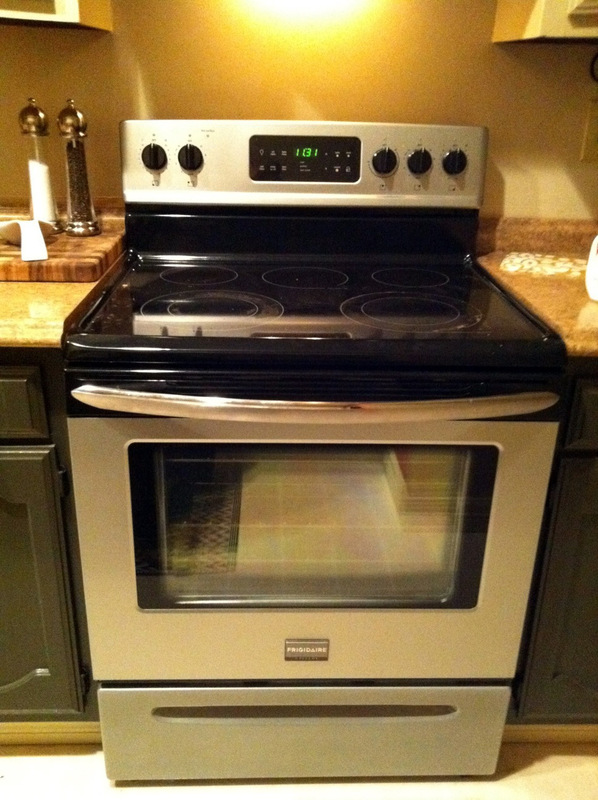 Oven: The existing oven was quite ugly. It was off-white with wood grain inserts- talk about dated. We cruised the clearance aisle at Lowe's until we found one. 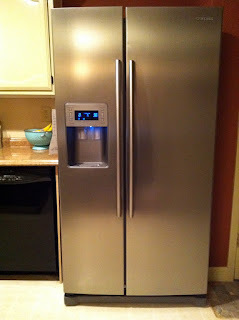 We liked that this Frigidaire one had black and stainless steel so it would tie in with the existing black dishwasher. I know some people have to have a gas stove, but I'm no chef so electric works just fine for me! 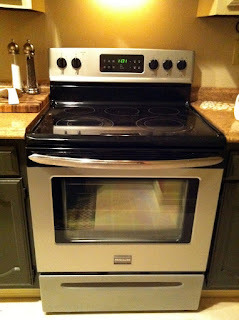 The oven was a display model so we got it for only $300. 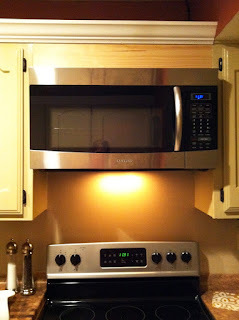 Microwave: We didn't get a huge discount on this one- only $100 off. We ended up paying $200. The previous owner didn't have the microwave built in and just had hers on the counter. As you can see, there isn't much counter space in our kitchen, so that microwave was taking up valuable real estate. 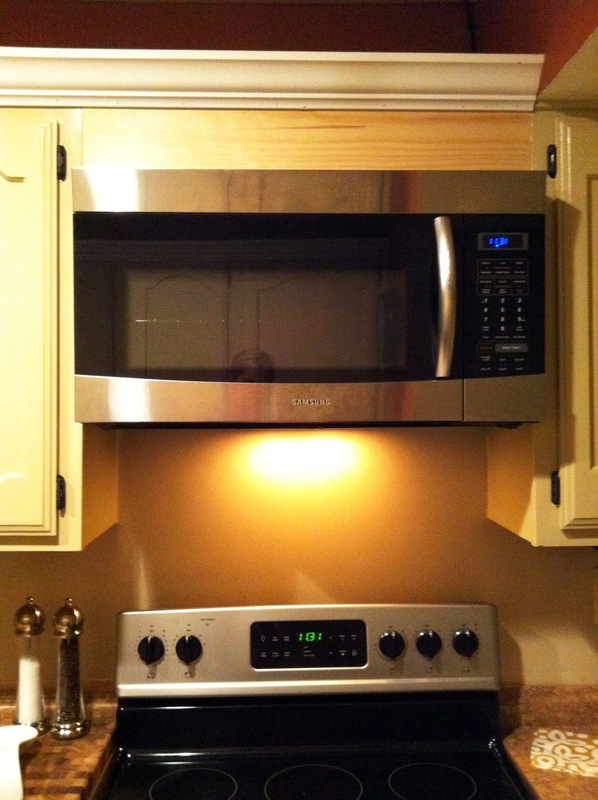 We decided to buy a microwave that we could build into the cabinetry above the stove that had a vent and lights built into the bottom. This Samsung did just the trick (and was on clearance, of course). Scott and our super-helpful neighbor had to remove the cabinets above the oven, along with the white vent hood that existed before. They had to install an electrical box into the wall where the microwave would go and get all of the wiring right. They added a cedar 2x4 to fill in the gap between the microwave and the top of the existing cabinets to make it look like it had been there all along. We haven't gotten around to painting the cabinets yet so it's still bare wood grain, but I can't wait to see the final product. Scott and our neighbor also added some decorative moulding to the top of the cabinets that made them look more custom and expensive (for very little $). We've done a few other things in the kitchen– new countertops and a faucet upgrade– that I'll save for another post, but the appliances are a big part of the change in the kitchen thus far. The appliances look great and best of all, they work great! Since I spend so much time in the kitchen, that is really important to me (cough* cough*). Kitchen changes on deck: paint the walls, paint the cabinets, add backsplash, change floors. Can't wait!